Bench Option: Juan Francisco Treat? For those of you who didn’t know, yesterday was the non-tender deadline for Major League Baseball. This means that teams had to decide which of their arbitration-eligible players would be offered arbitration, which would be signed to deals in order to avoid arbitration and which would be allowed to become free agents (aka non-tendered). Most of the decisions the Yankees had to make were obvious, and they ended up avoiding arbitration with Esmil Rogers, offering arbitration to Michael Pineda, Ivan Nova, Shawn Kelley and David Phelps and non-tendering Slade Heathcott, Jose Campos and David Huff. I wasn’t too concerned with the Yankees’ decisions, but I am very intrigued by one that the Red Sox made. They decided to let third baseman Juan Francisco go–they hardly have a reason to keep him after signing both Pablo Sandoval and Hanley Ramirez last week–and I think the Yankees should be all over him to fill out a bench role. First of all for those of you gathering rocks with which to stone me, I am not talking about Ben Francisco. That guy is the worst there is, the worst there was and the worst there ever will be. I’m talking about Juan, the left-handed infielder. Anyway, the 27-year old Dominican’s main tool is his left-handed power bat. Dude can put away a fastball like a man is supposed to. 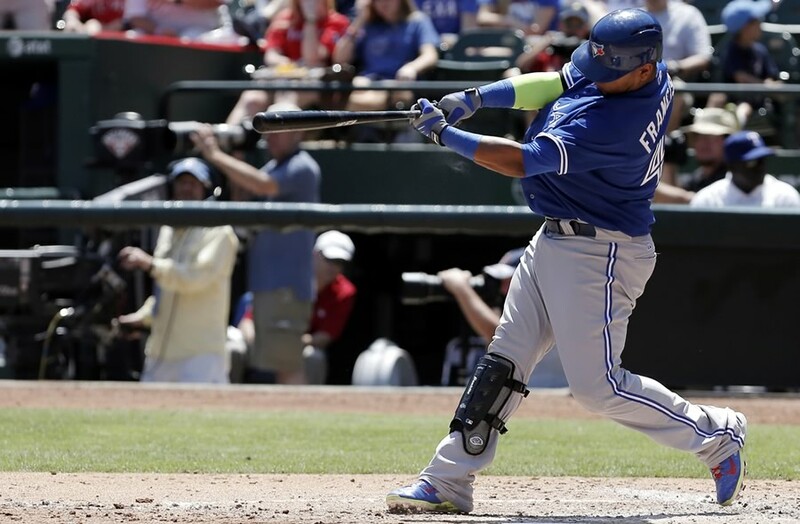 Last year, he clubbed 16 homers and drove in 43 runs in just 287 plate appearences for the Toronto Blue Jays, adding 16 doubles to boot. If you make a mistake to this guy, you’re going to immediately regret your decision. He once hit a ball 502 feet while with the Reds in 2011. In a real game. 502! OK it was disputed, and might have only been 482, but still. In case I haven’t made myself clear, the man can hit baseballs over the fence. He can also play both infield corners, which is a huge bench need for the Yankees, what with “Tissue Bones” Teixeira and “Bum Hip” Rodriguez currently commanding playing time in those spots. Francisco would provide the Yankees with a power bat off the bench, which they haven’t really had since maybe Andruw Jones or Marcus Thames. Just picture him taking hacks at that short porch! Francisco does come with some negatives, however. For one, he’s not good in the field at all. He’s no Chase Headley at third, and certainly no Mark Teixeira in his prime at first base. With 11 overall errors (9 and 3B in 482.2 innings and 2 at first in 127.1 innings), you can see why he’s not the ideal glove man for any team. The other main flaw for Francisco is that he’s gonna keep a lot of fans cool with all his swings and misses. He struck out 116 times while walking only 27 times in his 320 plate appearances last year, which leaves him in Hensley Muelens territory at a 37% K rate. To put it in perspective, Adam Dunn only struck out about 29% of the time during his career. Because of the high strike out rate, Francisco has only slashed .236/.297/.439 over his career, which is pretty paltry. All that being said, the Yankees need a guy that can come in off the bench in a big spot and hammer the ball over the fence. I would have killed for a bench guy like that over the last two seasons. The Yankees might have had some guys that would have been great coming off the bench, but the problem is that those guys ended up playing every day, because they were signed to be every day players for some ungodly reason. A team can afford to carry a .220 hitter who can sock dingers every 15-20 at bats if he’s playing every fifth day. When that guy is playing every day, there’s something seriously wrong. My buddy Tom compared him to Ruben Sierra, who was a guy who could DH from time to time or come off the bench, go 1-5 with a homer and help the team put up runs. Those guys are fun to have on the team. Those guys are necessary. The Yankees have plenty of speed and defense on the bench with Brendan Ryan and Jose Pirela possibly vying for bench roles. They desperately need more pop in this lineup. Francisco can probably be had for very little money and time commitment. He can help spell both Martin Prado and Teixeira (once Alex Rodriguez gets hurt), and hey… you can’t make any errors at DH either. I don’t think this is a make-or-break must sign for the Yankees, but who doesn’t like dingers? Get us all our Juan Francisco treat (this will undoubtedly be involved in John Sterling’s homer call for Juan too.) Just go ahead and sign this man today, Cash!